Michael Beard is a physicist, ambassador, liar, self-congratulatory womaniser, thief and… fictional character. McEwan’s newest protagonist is a difficult, immoral slob and a somewhat complicated literary creation. A Nobel Prize winning scientist whose best years are behind him, Beard is a climate change sceptic who begrudgingly accepts a position at a new government-funded centre for global warming research. When Beard realises that he can pass a dead man’s invention off as his own, his public views on climate change take a not-at-all-surprising U-turn, and he tries to secure his fame and fortune as a global warming capitalist. But don’t be fooled; Solar isn’t a book about global warming per se – it offers no preachy moral positions or scientific posturing. In fact, everything about the book is refreshingly straight-edge; the text gives no sympathies or judgements and doesn’t fall down on either side of the climate change debate. What’s more is that Solar is strikingly funny. My opinion of Ian McEwan has always been that he just doesn’t ‘do’ comedy, yet I found myself surprised by the wit, self-deprecation and satire that run rampant through these pages. Solar is a true comic novel. The writing is reliably brilliant (this is by no means a back-handed compliment; the psychological realism is comfortingly familiar and McEwan’s easy turn-of-phrase is as vibrant as ever- you know you’re in safe hands with the prose). It’s text-book McEwan; long compound-complex sentences are often followed by staccato, single-clause efforts as the writer drives home his metaphors and asides. 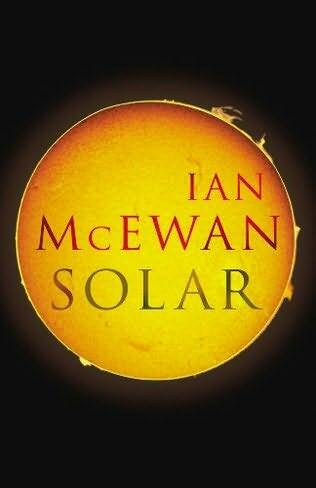 Yet McEwan isn’t an omniscient narrator; Solar belongs to Michael Beard. The prose is framed through ‘free indirect discourse’; a narratorial technique by which the novel is posited in the third-person singular, but is told in such a way as Beard might himself tell the story. However, this narrative style belays some unfortunate failings in the novel: Beard is the only well-developed character. Melissa, one of Beard’s many sexual distractions, is a beaming cliché of joyous new motherhood; whereas Tarpin, the lover of Beard’s ex-wife, has all the depth of a long-abandoned bird bath. What we are left with, then, is an exercise in character study. It is down to the reader, as jury and judge, to declare the moral outcome of the novel. There are valid arguments to both praise and loathe Michael Beard; he’s dedicating his life to clean energy technology and he genuinely wants to further the study and cause of science. Conversely; he’s adulterous, quick to anger and self-serving. There is no objective way to label or define this work – it can be described as a pathos-riddled story of tragic self-destruction just as easily as it can be called a jovial comedy – a ribald satire on events that currently grip the public imagination. And, for the fence-sitters amongst you, it can be both of these things at once. What I’m saying is that McEwan has crafted a masterwork of comic ambiguity – an impressive literary feat. Now, I don’t want to be accused of recording an open verdict when it comes to a novel such as Solar, a book that can be read in so many different ways; so I’ll conclude this hearing with my own judgement of Michael Beard. I think he’s a despicable character; every moral and professional decision he makes is the complete opposite of what I’d do in the same situation. Many commentators describe him as ‘self-deluding’, but I couldn’t disagree more with this appraisal. Beard is entirely self-aware; in fact, part of what makes his story so funny is the constant self-analysis of his physique, health, position in society and emotional relationships. Beard’s only concern is his own success and he will abandon friends, lie and manipulate others to achieve it. This entry was posted in Novels, Reviews and tagged Ian McEwan, Solar. Bookmark the permalink. Regardless, I have the feeling that I would agree with you about Beard– he seems like the villain, not the hero (or anti-hero as the case so often is).